_MAL3713.jpg, originally uploaded by Michael A. Lowry. 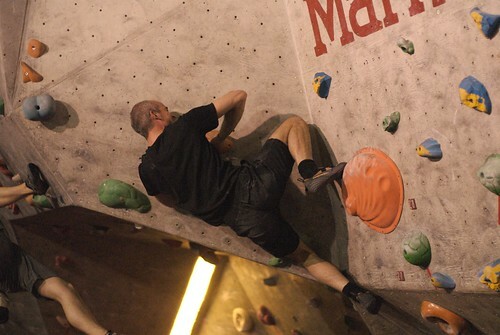 I went to Karbin tonight for the boulder open. It was a lot of fun and very challenging. I completed 25 out of 40 problems this time — one more than than last time, but still one off my record of 26. When the rankings have been tabulated, they'll be posted on Karbin's competitions page. Update: I placed 6th — not bad! The problem of orange grips pictured above was a tricky one. It was necessary to pull oneself up on top of the orange grip I'm holding with my hands, and then reach up to another grip just off the top of this image. That was the hard part, and it took me a few tries before I did it successfully. Tonight when I had climbed ten or so problems, I thought to myself, “this boulder open is harder than the last one!” It's funny, because I remembered thinking the exact same thing last time. For some reason I always get the idea that each boulder open is more difficult than the one preceeding it. But in fact, each time, I complete about the same number of problems. So either I'm getting better at a rate equivalent to the increase in difficulty, or I'm not really improving very quickly! As in past competitions, tonight there were a couple of black-graded problems that I could almost complete, but not quite. I didn't even try any of the white-graded ones. I met some new folks tonight, including sisters Elin and Emma, who did a great job considering that they've only been climbing for a couple of months. Hung and Daniel were there, and they made the rest of us look like we were working too hard. Christian K. was there too, and he gave me some good tips on a couple of problems. Isabelle, Patrick, Zindy and John were there as well, and some of us might go bouldering together in Kolartorp on Sunday if the weather cooperates. Follow that link and click on the "stor bild" links to enlarge the photos. I especially like this one. I have posted 34 photos from the evening, including some of Åsa and Colleen, who were there climbing the top-rope routes. What — dancing without photos?